Take a dip in these photogenic pools. A vacation isn't complete without lounging poolside with a cocktail in hand and of course, snapping a photo for Instagram. With the never-ending social contest for the most picturesque posts, your standard infinity pool just isn't going to cut it anymore—here are the most photogenic pools in Asia you need to be seen at. Dubbed “the most luxurious hotel in the world” and sometimes “the world's only seven-star hotel” for its over-the-top decadence, the Burj Al Arab Jumeirah also stands as the third tallest hotel internationally. With a total of five swimming pools, this indoor infinity pool—which overlooks the cityscape—is definitely our favourite. For endless lounging and poolside frolicking, check into the Anantara Kihavah Maldives Villas. Besides a gigantic 49m fiber optic-illuminated swimming pool, the resort's over-water pool villas boast private infinity pools just inches from the crystal blue lagoons—you won't have to worry about any photobombs, unless a dolphin decides to steal your limelight. If you thought this was just another infinity pool, wait till it lights up at night. Illuminated by fiber-optic lights, Paresa Resort's cliff pool looks almost ethereal against the night sky. Perched on the Kamala Cliffs in west Phuket, the cliffside villas are a haven for nature lovers. With a name like Trisara—which means “garden in third heaven”, expect nothing less than a beachside paradise. Besides private infinity pools with spectacular ocean views, the hotel's 45m saltwater pool extends across the pristine beachfront, dotted by lush tropical trees to set the scene for your perfect vacation 'gram. Sitting 70 metres above sea level atop a cliff in Ungasan, southern Bali, indulge in the island life at Banyan Tree Ungasan. Get lost in the spectacle of the majestic Indian Ocean as you soak in the resort's infinity pool, which seems to extend beyond the horizon. A glass of martini or pina colada from the poolside bar makes the perfect prop for your snap. Located at the private island of Song Saa, Song Saa Resort blurs the line between ocean and pool. With a strong emphasis on sustainability and preservation of nature, each luxury villa is constructed and decorated with recycled, reclaimed, or repurposed materials. 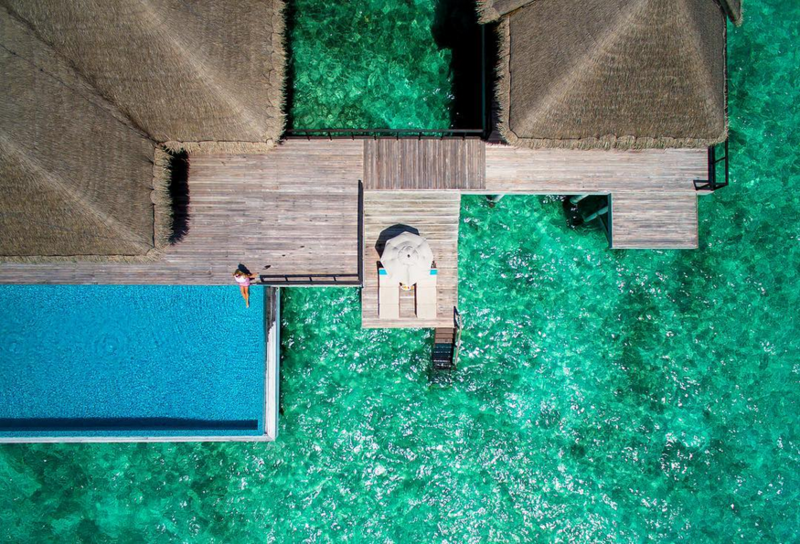 Between lounging in the private pool of your overwater villa and plunging into the ocean just a dive away, snap a photo to immortalise your island vacation on Instagram. Boasting six heated pools—including world’s largest skytop wave pool—, waterslides and adventure rapids at 575 meters, the Galaxy Macau might as well be a water theme park. You can even catch a pack of mermaids having a splashing time when you visit in summer. For the best Instagram shot, have your friend snap you through the crystal-clear water slide at the Grand Resort Deck. Glittering with gold plated tiles and opulent decor that nod towards the palaces of ancient China, The St Regis Lhasa Resort's gold energy pool is a sight to behold. Re-energise yourself with a soak in the glistening waters, fit for an emperor. Sitting 8,000 feet above sea level and amongst a dense forest of pine and cedar, The Wildflower Hall will steal your breath with its magnificent views of the snow-capped mountains of the Himalayas. Take in the sights as you soak in the heated infinity whirlpool at the mountain retreat, which transforms into a snowy wonderland in winter. No instagram-worthy pool list is complete without Marina Bay Sand's rooftop infinity pool. Cited as the world's largest, the pool towers above the city skyline at 57 levels high for paranomic views of Singapore. A landmark in its own right, the infinity pool has made its appearance in the feeds of celebrities and famous personalities. Is there a better photo-taking opportunity than this?